The MediaTune Com1000 Completely Solves Bars & Restaurants Biggest Problem With Multiple TVs… Changing The Channel. Until now, the only option Sports Bars and Restaurants had for controlling multiple TVs with a single remote device was an extremely expensive matrix switcher with a AMX or Crestron controller. Technicolor and DIRECTV have delivered a game (and channel) changer for bars and restaurants – the MediaTune Com1000. The proven reliability of the HD technology in the Com1000 Pro:idiom based HD headend has been the standard in hotels, hospitals and similar installations where there is a need for a single cable solution to multiple rooms. The Com1000 Headend offers the convenience of up to 24 HD tuners per module in a compact 4u rack based system. 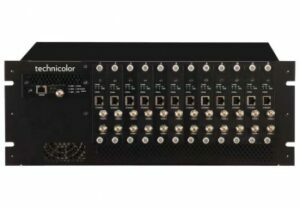 The new Technicolor MediaTune Com1000 system is a revolutionary video management system based on the COM1000 DIRECTV satellite headend solution that has been specifically designed to serve the Bar and Restaurant market. This HD Switched Matrix System for DIRECTV gives you an integrated web server accessible via any device with a internet browser. You can easily access it on your PC, tablet, iPhone or iPad with an experience as simple as using an iPad app. Place a DIRECTV receiver at each TV. This required a tremendous amount of wire run and multiple remotes (DIRECTV remote controls will only control 4 TVs maximum per remote). Even in a sports bar or restaurant with great organization, finding the right remote can be a challenge on a busy night. The other option was the use of a Matrix Switcher and AMX or Crestron controller and programming. A matrix switch is a big and expensive box that allows you to connect any receiver to any TV and AMX and Crestron controller and programming gives you the ability to control everything from one central point. The downfalls of this type of system are the high cost and the sheer size of the rack required. The matrix switcher itself is very expensive and a Crestron or AMX controller and programming is expensive as well. Combine the space requirements of a matrix switcher and the Crestron or AMX controller with the receivers and you needed space in your bar for multiple racks of equipment for a 24 channel setup. A double whammy for the bar or restaurant owner. 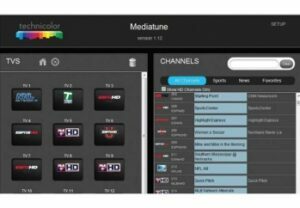 The MediaTune Com1000 Solution for Bar & Restaurant Video Distribution Problem. The MediaTune Com1000 gives you the convenience of a Matrix Switcher with AMX or Crestron controls in a compact form factor. It offers up to 24 HD tuners with up to 24 digital QAM outputs in only 4 units of rack space (4U). This compact design also results in dramatic power savings from the typical stacked receiver and matrix switch solutions. Because the DIRECTV content is delivered over QAM distribution there is no signal transcoding, encoding or other signal manipulation which can degrade picture quality. Because the MediaTune Com1000 features Pro:Idiom digital rights management, the DIRECTV signal is copy protected from the source to the TV. Digital QAM distribution means simple wiring to the televisions from the headend system. Rather than the homerun wiring (a single wire from switch to each individual TV) required for many matrix switchers; HDMI, CAT5 or RF coaxial cable can be installed in a loop-through manner by simply using taps and splitters to distribute the HD signal to each TV. The Technicolor MediaTune Com1000 headend gives you the flexibility to access it from any web enabled device. In other words a PC, a laptop, an iPad, or even your iPhone or smartphone. It’s so simple to use, drag and drop, that any of your staff can be trained in its use in just a few minutes. The MediaTune Com1000 is a fundamental shift in how bars and restaurants have been forced to approach video distribution in the past. The old RF distribution systems provided a fixed channel line-up allowing each TV to tune through the channels. In the Mediatune configuration, each TV is set to a fixed QAM channel and the source is switched. The MediaTune controls are accessed via any device that can access the internet such as a PC, Tablet, iPhone or iPad, or smartphone and allows you to search through the entire DIRECTV channel package to select the desired programming. Then using simple drag and drop interface, place that programming on the desired TV to watch. You can watch the same content on all the TVs, or depending on how many tuners are in the system, each TV can have its own tuner allowing each TV to watch a different source channel. This is the perfect system for bars and restaurants because the MediaTune system is easily scalable as you grow. Adding TVs or more tuners is simple and doesn’t add space requirements to your rack. Even dedicated sports bars rarely exceed 24 tuners and with the MediaTune Com1000, those that do can easily scale up the system for more channels or show the same programming on multiple TVs. Unlike matrix switch based system, with the MediaTune system you can also use more than one device to control the programming shown. The system automatically syncs on all control devices. Easy to Use – Simple web based interface controlled by a PC, Tablet, iPhone or iPad. Dramatic Power Savings over typical stacked receiver & matrix switcher setup. It’s All About Satellites is Your Source for DIRECTV for Bars and Restaurants. We were the first DIRECTV dealer in the Southwest USA to install a MediaTune Com1000 and with over 16 years of experience in the hospitality industry, our staff is ready to support the needs of your bar or restaurant.